Posted on October 6, 2014 December 2, 2014 by Norte! We love our worms. They are the VIPs of Carter’s Compost. They eat kitchen scraps day in – day out and never complain. We have a lot of worms. We started with 1000 red wigglers in 2006 and now have at least a trillion or so 😉 We keep them in 17 (and counting!) storage totes that we re-purposed into worm bins. From May to November, they all live in our garage here at C’sC World HQ. They help us by turning our member’s organic waste into black gold which we use in our Urban Farm. Normally, come winter, we haul them all down to the basement where they spend 5 dark, less-than-awesome months. Not this year. After 8 years, mom’s tired of them in the basement. Therefore, we are launching a new community project, Worms To Classrooms, in which we are partnering with Traverse City teachers to host one of our worm bins for the winter. Worms are easy. They’re fun. The kids will love them and learn lots, too. 1. Sign up for a worm bin by emailing us at carterscompost@gmail.com. The worms will be loaned out in a first come-first served basis. Again, we have about 17 at the moment. 2. Come to C’sC World HQ sometime before 11/15 to pick up your worm bin. 3. Put the worm bin in your classroom. Take care of them. Feed them. Love them. 4. Teach the kids about the awesomeness of composting and the importance of reducing your foodwaste.Teach them that worms are Compost Champions and that banana peels (and all other organic waste from home/school) don’t belong in the landfill. 5. Once school gets out, return the bin to C’sC World HQ. 6. Give yourself a High Five for supporting bike-powered community composting in Traverse City and making mom super happy. If you would like to purchase some of our worms for your very own, you can do that too. More info HERE. Posted on September 9, 2014 September 9, 2014 by Norte! The Grand Traverse Mycological Society is hosting the Radical Mycology Collective’s Tour for a 2-day Mushroom Cultivation and Application Course in Traverse City, September 27-28. The course will finish with a hands-on, collaborative mushroom installation here at Carter’s Compost World HQ. The plan is to innoculate new mushroom beds around 2-3 of our Apple Trees using Oyster and King Stropharia. Our Mirror-Mirror Pile will also be inoculated with Shaggy Mane mushrooms. Compost and Mushrooms. Like Peanut Butter and Jelly. Awesome, right? In addition, The GT Mycological Society will be hosting a kids workshop in the Carter’s Compost Urban Farm Sunday, September 28, at 2 pm. What does it mean to be a decomposer? How can we work with mushrooms to clean water and soil? Come find out through a hands-on activity where we will make mushroom growing kits that you can take home! Join us as we play games, act out ecological roles and explore the amazing world of forest fungi. Expect a 1 hour workshop. Perfect for kids aged 7-13. Donation based to help cover costs, suggested $10, however no one turned away for lack of funds. There are only 10 openings so please reserve your spot by emailing us at carterscompost@gmail.com. To learn more about The Grand Traverse Mycological Socitey and their mission of providing people with the resources necessary to learn and explore the fungal kingdom email GTMycoSociety@gmail.com. Register for the Cultivation and Application Course HERE. As always, please, Compost On! Posted on August 14, 2014 by Norte! We’ve been fortunate to partner with the crew from Michigan Youth Opportunities Initiative (MYOI) on several occasions. Last year’s Neighborhood Compost Fiesta, July’s Community Compost Screening Work-bee at Oryana and a recent bike-powered bucket slinging session. They are a great group of young people. Eager to learn. Hard working. True compost champions. Together we rode bikes, picked-up our neighbor’s kitchen scraps, screened Traverse City dirt, grew community compost and greened our neighborhoods. We talked about C’sC and our vision of small-scale, bike-powered, youth-driven community composting. We shared our start-up story of re-using/re-purposing/re-loving things (bike trailers, buckets, pallets, organic waste) to launch our social-entrepreneur-ish business. We encouraged them to become involved in their community and seize opportunities. Carter’s Compost is definitely looking forward to more collaborations in the future. Keep awesome, MYOI, and Compost On! Posted on June 21, 2014 December 21, 2014 by Norte! In partnership with NORTE! and awesome local farmers like Birch Point Farm and Meadowlark, we are now providing bike-powered home delivery of your CSA Box. For just $5/delivery, we’ll pedal your box from the drop-site to your house using our cargo bike trailers. Perfect for those Traverse City CSA members who can’t fit a drop-site pickup into their busy schedules. You can sign up for the entire season or simply request a delivery on an as needed basis (24 hour notice required). And for just $3 more per week, we’ll get you a C’sC Bucket and pick up your kitchen scraps too. Full circle. Awesome, right? More info HERE on how that works. Supporting CSA By Bike means one less car on the streets of Traverse City, a smaller carbon footprint for our community, green jobs for our riders, and more time for you. Before signing up, make sure you live within the blue boundary shown on the map below. Special instructions for delivery? Where we should drop-off? $5 per CSA box delivery. $3 per compost bucket pick-up. We accept cash, checks to Carter’s Compost, Bay Bucks and PayPal. You can pay per delivery/month/season and stop whenever. We are now looking for more CSA farmers with Traverse City drop-sites to partner with. If interested email us at carterscompost@gmail.com to get started. Posted on June 4, 2014 June 4, 2014 by Norte! Starting this Saturday, June 7th, we’ll be offering kitchen scrap drop-off for the Sara Hardy Farmer’s Market goers. We’ll be bringing our bike-powered Mobile Compost Pile to transport your scraps from the market to C’sC World HQ or one of our Neighborhood Sharing Stations. This is a pilot project for the month of June to test it out. 1. Come to the market. Shop local. Buy local. Eat local. We’ll by near Norte! TC’s Bike Valet on the west side of the market by the SEEDS Office (aka “The Birdhouse”). Maybe you can even come by bike? That’d be awesome. 2. Bring your bucket full of kitchen scraps to the market. What can go into the bucket? Well, most everything that grows is OK.
cereal etc., coffee grounds & filters, tea bags (staples OK), egg and nut shells, pits. Please NO meat, dairy, bones, chicken, fish, greasy food scraps, fat, oil, dairy, animal waste, litter or bedding, coal or charcoal, coconuts, yard waste. 3. Grab a clean bucket and lid off the bike trailer. 4. Buy lots of yummy/healthy/local veggies and fruits from the market and start filling up your bucket again with scraps. Come back the following Saturday to drop-off and grab a clean bucket. If you can line the bucket with a regular grocery store paper bag (keeps the bucket scrubbing to a minimum) before adding to it, that’d be fantastic! Feel free to email us at carterscompost@gmail.com with more questions. Cost? Because we love our Downtown Farmer’s Market, drop-offs will be by donation only during this pilot period. Compost On! and we’ll see you Saturday. May. So far. So good. Posted on May 15, 2014 May 17, 2014 by Norte! How’s your May going? Our’s has been killer. It’s only half way done and May is already been the most awesome month of the year. So far. So good. – Crushed our Bike-powered Community Kickstarter Project. We raised almost $4200 via 70 backers from all over the planet. We’re super excited about our new cargo trailers and the Traverse City Dirt Tshirt. – National Compost Awareness Week rocked. Signed up/renewed 14 members who’ve committed to being Compost Champions. Screened 15 buckets of our 100% awesome locally grown compost during our Neighborhood Dirt Party. And added another “pile sharer” to our map. We will be using this money to expand our bicycle cargo trailer fleet as we aim to get more trailers to more kids in more TC neighborhoods. – Enter the crew from Gainesville Compost and Kanner Karts. We’re teaming up with them to bring 3, yes 3!, of their awesome PRO trailers to Northern Michigan. They will be our Big Boy (or Girl!) trailers and allow us to Dream Big as we expand our bike-powered, community bucket slinging operation here in Traverse City. – Inked deals with some awesome Sponsors. If you see any of them around town make sure to give them a High Five for supporting C’sC and helping us to green our TC. Thanks for reading and Compost On! Happy Compost Awareness Week ! Posted on May 3, 2014 by Norte! International Compost Awareness Week (also known simply as The Awesome Week) is upon us. It runs May 5 – 12. It’s a big, big week for us. Sounds like fun, eh? They don’t call it The Awesome Week for nothing. 1. Take the C’sC Promise and commit to being a Compost Champion. 2. Collect your kitchen scraps. Start a pile. Pick some red wigglers and build a worm bin. Or sign up for our bike-powered pick-ups and get a Free Bucket. 3. Inspire your mom/dad/sister/bus driver/neighbor/bank teller/ co-worker/librarian to take the C’sC Promise and become a Compost Champion too. 4. Join us on Saturday, May 10, 2-4pm, at C’sC World HQ for a Neighborhood Fiesta. We’ll screen dirt, wrangle worms and listen to latin music together. Take some of the dirt that you screened home and use it in your garden. Growing neighborhood food with neighborhood compost made from neighborhood kitchen scraps is awesome. Our C’sC College of Compostology will also be in session so if you want to learn how to compost in your own backyard, we’ll be giving tours/demos. It’s going to be awesome. You should come. Bring your garden gloves and your smiley face. See you soon and Compost On! Posted on May 2, 2014 March 29, 2015 by Norte! Commit to being a Compost Champion! 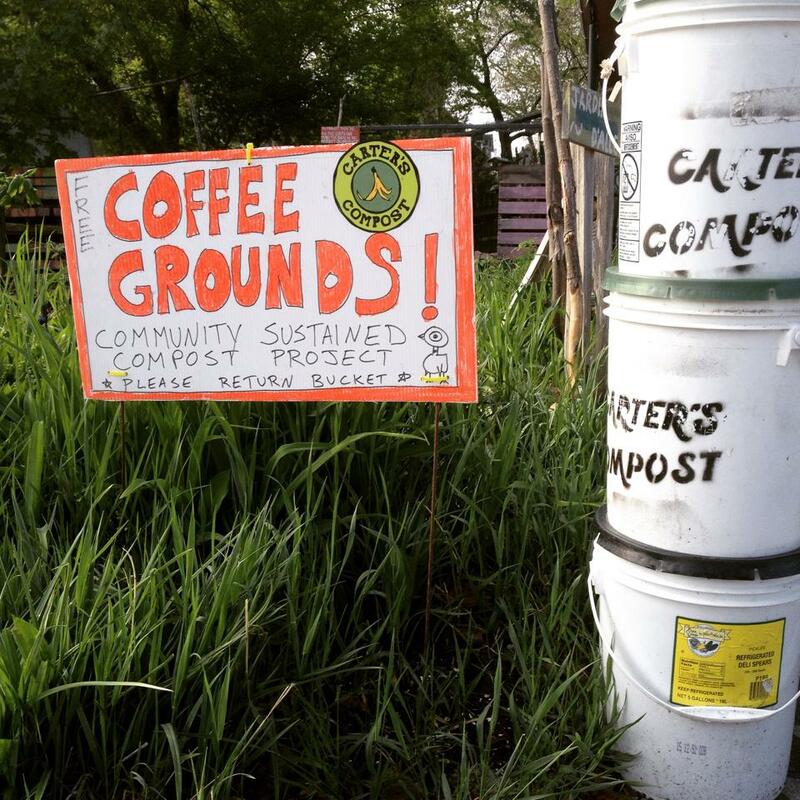 The Carter’s Compost Promise is a grass-roots initiative designed to create awareness about the awesomeness of small-scale/backyard/neighborhood composting and to increase TC’s composting rate. Composting is easy. Really. It’s also, in our opinion, the most environmentally friendly form of recycling there is. We hope that by taking the Promise you’ll give it a try or get back in the groove if its been awhile. “I, [your name], promise to be awesome and to try my best to compost my kitchen scraps. I will harness the power of the pile to reduce my waste, grow great garden soil and make Traverse City greener than ever. I will be a Compost Champion and inspire my neighbors to be one, too. Yay, Compost! 6. Give yourself a High Five for being awesome and helping to Green our TC. Not sure how to compost your kitchen scraps? The EPA’s website is a good place to start. Our GT County’s RecycleSmart site is also great. You can sign up for bike-powered pick-ups HERE. Or if you’re already recycling your kitchen scraps at home, consider sharing your pile with your neighborhood bucket slinger so that we can add you to our map HERE. Let’s Compost On! together and make TC the most compost-errific in Michigan The Universe.